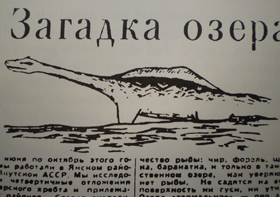 This bizarre beast was seen by a team of scientists while grazing along the shoreline of Russia’s volcanic Lake Khaiyr, making this arguably the most significant eyewitness report of a frightening, quasi-prehistoric monster ever recorded. Dwelling deep within the bowels of the shallow, yet actively volcanic, Lake Khaiyr (also known as Lake Khainyr) — located in the isolated , permafrost ridden Yakutia region in eastern Siberia — is a beast which has stirred both fear and controversy ever since it first reared its head in front of a renowned, Russian biologist and a team of scientists from Moscow State University. The biologist in question was one Dr. Nikolai Gladkikh, who, in 1964, made the pilgrimage to this remote region in order to sample rare mineral deposits and survey the Yakutia in Siberia. 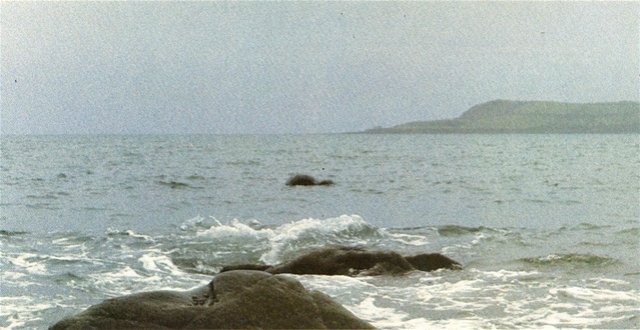 It was in a moment of quiet on the rocky shore of Lake Khaiyr that Gladkikh had the first encounter with this beast. While most LAKE MONSTER sightings are of vague humps or serpentine necks bobbing in the center of the lake, Gladkikh’s sighting is made more intriguing by the fact that he saw the creature close to the shore and almost entirely above the waterline. Gladkikh claimed in his account that he had woken early on that misty morning in order to gather water — and enjoy the solitude and placid splendor of a Khaiyr sunrise — when he was confronted by an amazing sight. According to Gladkikh, as he fetched water on the edge of the lake he was shocked to see a small headed, primeval looking animal emerge from the water and begin to feed on the long grass sprouting up along the shoreline. 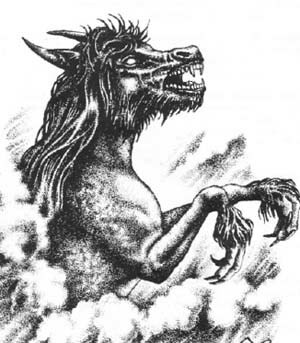 Gladkikh described the being as a massive, long-necked, blackish-blue, reptilian quadruped with a heavy tail and a lizard-like head with two, tiny supra-orbital horns. 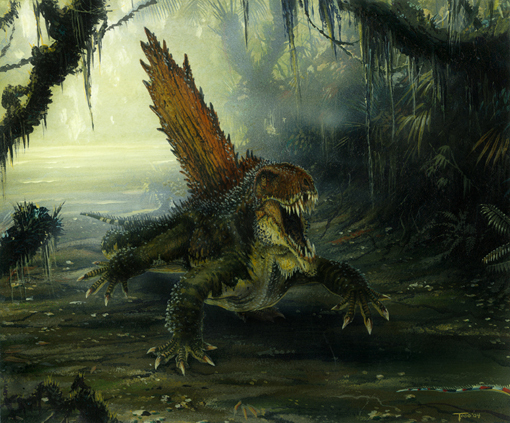 The creature’s most distinguishing attribute, however, was the squat, triangular fin (supported by vertical rays) that ran down the length of its spine, not unlike a dimetrodon. Wasting no time, the terrified — yet no doubt exhilarated –biologist swiftly made his way back to the base camp in order to alert his teammates about his incredible discovery. Gladkikh, now armed with a rifle, returned to the beach with his fellow scientists in tow, but the only evidence that remained was a large swathe of flattened grass. His cohorts were understandably dubious concerning the beast he had described, but just when it seemed as if Gladkikh was going to have his vodka ration terminated, the expedition chief, Dr. G. Rukosuyev — along with two of his assistants — claimed that they watched in awe as the very same (or a remarkably similar) life form reemerged in the center of the lake just two days later. 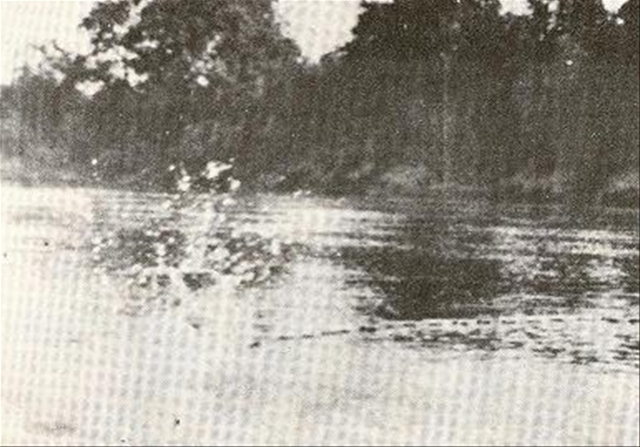 After this second event, Rukosuyev and his men described the animal in much the same way as Gladkikh, only their accounts included the appearance of a distinct dorsal fin. The witnesses all agreed that the monsters epidermis was so black that it almost looked blue. 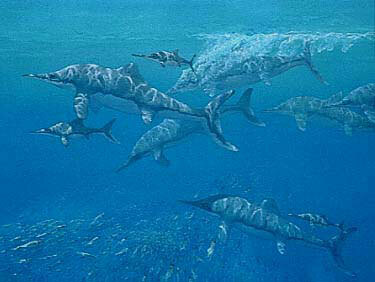 Perhaps the strangest theory of all came from Rukosuyev who speculated that the creature might be a relic ichthyosaur. This seems dubious as the shark-like ichthyosaur did not match any of the eyewitness descriptions, including Rukosuyev’s! It wasn’t long before word of this enigmatic entity found its way to the press and the scientists’ reports were published in the Komsomolskaya Pravda and the magazine Soviet Life. From there the story took on a life of its own, spreading swiftly across the globe. Sadly, due to the remoteness of Lake Khaiyr (as well as the lack of photographic evidence) it wasn’t long before the public’s interest died down and the legends of this mysterious monster began to fade once again into obscurity. Skeptics, recognizing the fact that Khaiyr is resting atop an active volcano, have been quick to conclude that most of the monster sightings have probably been caused by sub-aquatic tremors sending a rush of water boiling to the surface. These alleged academics have (of course) offered no explanation as to how a surge of water might resemble a grazing tetra-pod at close range. Doubters have also claimed that Gladkikh was not a scientist, but a migrant worker who was hired to help with the expedition. Whether or not Gladkikh had an academic pedigree, the fact remains that Rukosuyev and his comrades also claimed to have seen the same creature. A creature which some have even suggested may be related to the notoriously carnivorous WATER HORSES found throughout Europe. While skeptics will continue to raise the hoax flag — including the lake’s apparent dearth of fish, which might explain the beast’s penchant for feasting on the sprouts along the shore — one cannot ignore the fact that in the quagmire of the Cold War that permeated the Eastern Block in 1964, almost any event that occurred (or evidence gathered) behind the now defunct Iron Curtain will likely always be shrouded under a veil of contradiction and mystery. Unfortunately, there seems to be little scientific interest in the case and it would seem that those who continue to dwell near the mist smothered shores of Lake Khaiyr are forced to live not only in fear of the strange (and possibly prehistoric) beast dwelling therein, but also of the churning volcano that lies below the lake itself. Previous articleBRITS SEEK TO SAVE SHEEP-PIGS!